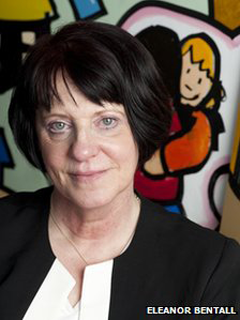 Parents should be banned from smacking children, the Children's Commissioner for England, Maggie Atkinson, has said. She told the Independent the law gave pets and adults more rights to protection from violence than children. There was a legal "loophole around the fact that you can physically chastise your child", she added. She called for a total ban under which parents could face criminal action. But she said that actively campaigning for a ban would not be a priority. Under current laws, mild smacking is allowed but any which causes visible bruising, grazes, scratches, swellings or cuts is not. Ms Atkinson told the paper: "Personally, having been a teacher, and never having had an issue where I'd need to use physical punishment, I believe we should move to ban it. "Because in law you are forbidden from striking another adult, and from physically chastising your pets, but somehow there is a loophole around the fact that you can physically chastise your child. It's counter-evidential." She said it was "a moral issue" and "taken to its extreme, physical chastisement is actually physical abuse". swelling, cuts, grazes or scratches. in local authority foster homes and Early Years provision. She had never understood "where you can draw the line between one and the other" and it was "better that it were not permitted", she added. But she said her office would not be campaigning for a ban next year "because there's a lot of other things in the queue". A government spokeswoman told the paper that, while ministers did not "condone violence towards children", they did not "wish to criminalise parents for issuing a mild smack". The NSPCC has said evidence is building that smacking is "ineffective and harmful to children". "There are more positive ways to discipline children and a clear message that hitting anyone is not right would benefit all of society," a spokesman said. Earlier this year, Justice Secretary Chris Grayling told the Mail on Sunday he smacked his own children when they were young and defended the right of parents to smack their children. The Conservative minister, who has two grown-up children, told the paper: "You chastise children when they are bad, as my parents did me. "Sometimes it sends a message - but I don't hanker for the days when children were severely beaten at school." And last year, Labour MP David Lammy said parents should be allowed to smack their children without the fear of facing jail. The MP for Tottenham told a Mumsnet webchat that politicians should spend less time telling parents what to do. He said it was "too easy for middle-class legislators to be far removed from the realities of the typical single mum".